A low-cost feeder option for your chicks, ducklings and adult birds. Yellow feeders are for baby chicks. 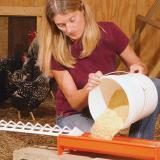 Orange feeder is better for larger birds (pullets, ducks, geese). 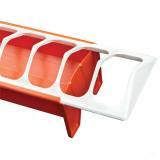 Easy to clean, move and store. 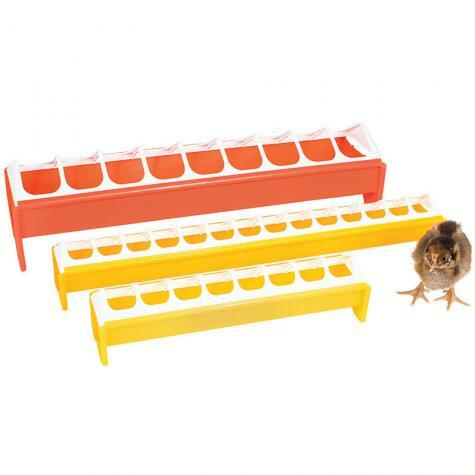 Lid helps keep birds from sitting in the food. Slide lid off at the end. Add feed and slide lid back into place. Wash in hot water using a mild soap. You may need to soak the feeder to loosen tough spots. Recommended: 12 out of 13 said they would recommend this product to a friend. 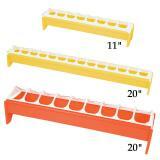 These are the only feeding trays we will ever use! 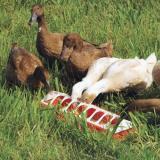 This product has been very helpful for raising young turkeys. However, I did find that it needed a cross piece in the center to make it stronger. The center eventually spreads out and the top doesn't stay on. I fixed it by screwing a round dole across the middle. Even with that said I will buy more when needed and recommend them to others. 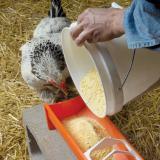 The Apollo 20 feeder has greatly reduced the waste of birds scratching or beaking the food into the bedding. The feeder does allow bedding to get into the feeder when it is set directly on the ground, but I believe raising it higher as the birds grow will help with that. 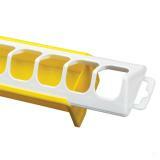 It holds a good amount of feed and is easy for the birds to reach into. 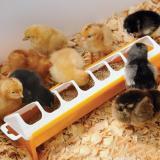 One of the better "chick feeders" I've tried. The Apollo 20 is a bit too tall for the youngest chicks, so I think I'll try the smaller version for younger birds, too.